Cabbage is a relative of broccoli, brussel sprouts, and radishes as a member of the cruciferous family of vegetables. Modern cabbage has developed over centuries from a plant brought to Europe from Asia by a band of Celtic people around 600 B.C.E. From then on, cabbage rapidly spread as a major crop throughout northern Europe because of its resiliency in colder climates. 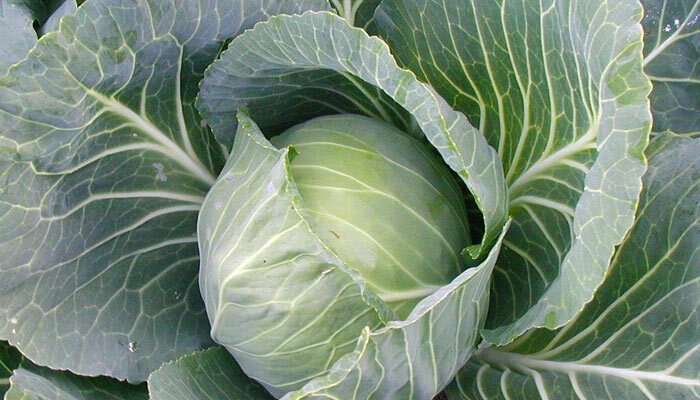 Early German settlers in the United States introduced cabbage. As a nutrient-dense, low-calorie food, cabbage is an excellent source of vitamins C and B6, potassium, folic acid, biotin, calcium, magnesium, and manganese. Cabbage also contains a powerful anticancer compound called glucosinolates. A 3½-ounce serving of cabbage contains only 35 calories. The American Cancer Society recommends eating cruciferous vegetables, such as cabbage, as a way to reduce the risk of cancer. Cabbage and other cruciferous vegetables contain more phytochemicals than any other vegetable family, which help increase antioxidant defense mechanisms, detoxifying harmful, caner-causing chemicals. Studies have shown that people with a high intake of cabbage have lower rates of cancer, particularly colon, prostate, lunch and breast. Cabbage can also help treat peptic ulcers by encouraging the regeneration of cells that line the gastrointestinal tract. Cabbage can be enjoyed both raw and cooked. Use raw cabbage to make coleslaw, or mixed into salads. Into juicing? Add raw cabbage to your next juice recipe. For a cooked application, sautéed equal amounts of cabbage with onions in olive oil and serve over buckwheat for a healthy side dish. What is your favorite way to prepare cabbage? For more preparation ideas, read my “Encyclopedia of Healing Foods”.